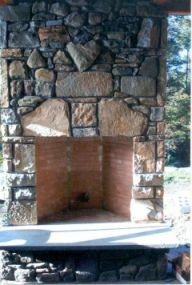 Osterhoudt Masonry has built dozens of fireplaces in the Catskills and Ulster County region of New York, ranging in styles, specifications, materials, location and use. We build classic fireplaces, Rumford designs and bluestone barbeques. Fireplace design gets a great improvement in efficiency from Benjamin Thompson of Woburn Massachusetts, a.k.a. Sir Benjamin Thompson, Count Rumford . 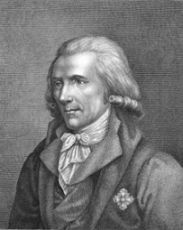 Thompson fled Massachussets during the American Revolution as he was a Tory (loyalist) and sided with the British as he had become wealthy and did not realte with the rebels. He actively recruited for the Tory's which made him increasingly unpopular with the locals as the revolution progressed. Eventaully, his house was attacked by a mob and he fled to the British lines and began working for the British Army providing intellegence. He moved to London at the conclusion of the revolution and never returned to the new United States of America. Benjamin Thompson spent seventeen years working in Bavaria for Prince-elector, Karl Theodor and received the title of Count of the Holy Roman Empire. He helped Karl Theodore reorganize the governement and is credited with re-designing the fireplace, inventing the percolating coffee pot and thermal underwear, among other credits (see his Wikipedia page). 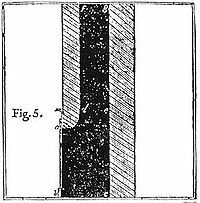 Count Rumford reckognized the importance of the radiation of heat and began to use brick and flat stones rather than cobble or field stones to reflect the heat back into the room more efficiently. 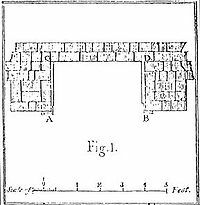 Beginning in 1796, his experiments on design led to his publishing an essay in which he said "The best fireplace is not deep and squatty, but shallow and high with slanted sides and back." His work in fireplace design led to increased air flow by reducing the chimney opening to increase the updraught. 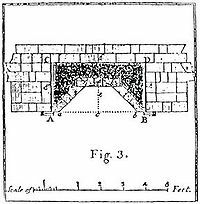 He and his workers changed fireplaces by inserting bricks into the hearth to make the side walls angled and added a choke to the chimney to increase the speed of air going up the flue. 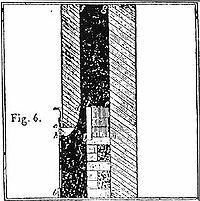 It effectively produced a streamlined air flow, so all the smoke would go up into the chimney rather than lingering, entering the room and often choking the residents. It also had the effect of increasing the efficiency of the fire, and gave extra control of the rate of combustion of the fuel, whether wood or coal. Many fashionable London houses were modified to his instructions, and became smoke-free. Thompson became a celebrity when news of his success became widespread (Wikipedia). 42" Rumford set with local Granite and fieldstone made by Osterhoudt Masonry. Rumford fireplaces were common from 1796, when Count Rumford first wrote about them, until about 1850. Jefferson had them built at Monticello, and Thoreau listed them among the modern conveniences that everyone took for granted. There are still many original Rumford fireplaces, often buried behind newer renovations. He also invented a cast iron stove which competed successfully with the famous Benjamin Franklin stove. Both devices gave much more control over the air flow into the fire, and were both much more efficient users of fuel. Such stoves were expensive, but saved so much fuel as to justify the cost of installation very quickly (Wikipedia). 5 foot Beehive Stucco and Bluestone Rumford under construction at the Emerson Resort in Mount Tremper, NY. 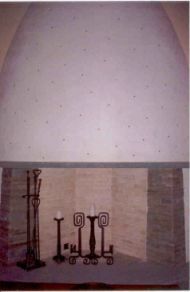 Fireplace cross section and design before the design changed the fireplace. The Rumford design changes increased the airflow and turbulance, hence reducing the amount of smoke entering the room and increasing the heat reflected back. Count Rumford at rest in Paris, France.